This article has been submitted as part of the Natural Capital Coalition‘s series of blogs on natural capital by Paul Gehres. I heard adults mention this throughout my childhood summers in America’s rural Midwest. While largely unappreciated at the time, what I perceived to be a common-sense comment was loaded in ways I did not yet understand. For when it comes to agricultural yields, farmers — and indeed all of us — ‘need the rain’. Human welfare is profoundly connected with the welfare of the natural world. The transition away from small farms to a service economy may have lessened our awareness of this dependence, but our agricultural and economic systems remain reliant on our ability to access natural resources and on stable earth systems, otherwise known as ‘natural capital’. Among a vast multitude of ‘services’, we rely on: (1) replenishment of soil quality, (2) stable precipitation patterns that cause neither extreme floods nor drought, (3) crops resistant to blight and disease, and more broadly (4) a stable climatic system. This issue of our dependency on natural capital resurfaces at an important time. The recent publication of the Natural Capital Protocol is an important (if early) step toward re-engaging with the topics of dependence and environmental risk management. In addition to the issues of stock (natural resources) and flow (services provided by ecosystems), the Natural Capital Protocol pushes organisations to assess their exposure to risks and opportunities through their impacts and dependencies on natural capital. While it is difficult to attribute the physical change on Shishmaref directly to global warming, the village’s dependence on permafrost, sea levels, and weather patterns is clear, and these natural capital assets were degraded by local climatic changes. Bees and butterflies — already experiencing decline in some regions (see IPBES study)— are natural pollinators that undertake an otherwise time-consuming, painstaking process for no compensation (i.e. no salaries, pensions). This story highlights two dependencies. Firstly, we rely on natural pollination (a natural capital ‘flow’) for our ‘pollinator-dependent crops’. We also rely on a stable climate to limit the geographic spread of tropical diseases. These examples of self-inflicted harm are occurring across the globe. Supplying food, water, and consumer goods to an increasing global population with higher levels of affluence will continue to prove a strain on natural resource stocks. As I’vewritten in a past article, there are several routes that policymakers could choose for embedding natural capital considerations into existing regulatory frameworks. One area of great potential could be instituting natural capital ‘budgets’. In the UK, the 2008 Climate Change Act instituted a process of creating five-year carbon budgets, i.e. a limit on the amount of CO2 the nation can emit each year. The recently released fifth carbon budget set targets for the 5-year period of 2028-2032. This process provides industry, investors, NGOs, and the public with long-term policy certainty on the ‘direction of travel’. One extension of this success in implementing carbon budgets would be instituting broader natural capital budgets. The introduction of natural capital budgets — while complicated and certain to face resistance — could also offer a holistic approach to environmental protection that combines a series of policy issues into one package. While it may sound ambitious, aspects of this concept are already being recommended to the UK Government. In the third report of the Natural Capital Committee (a UK government advisory body), the Committee recommended that national accounts should include a “national balance sheet of the value of our natural assets” and that “organisations should create a register of natural capital for which they are responsible and use this to maintain its quality and quantity”. As of February 2016, DEFRA and the Office of National Statistics (ONS) were working on a natural capital accounting project to integrate natural capital into UK environmental accounts. This renewed focus on our natural capital impacts and dependencies is not confined to the United Kingdom. In the United States, theWhite House released a Memorandum which directs Executive Partnerships and Agencies to ‘develop and institutionalize policies to promote consideration of ecosystems in planning, investment and regulatory contexts’. China was recently recognised as the ‘World’s Largest Investor in Ecosystems‘, with $150 billion spent since 2000. While the term has existed for decades, the concept of natural capital does now seem to have truly arrived, with work being undertaken at all levels through initiatives like the Natural Capital Coalition, the UK’s Natural Capital Committee, and the UN Natural Capital Declaration. It is still unclear whether it will be investors, businesses or governments that will take the lead to prioritise the protection of natural capital. Ideally, natural capital will follow the path of climate change policy, with investor pressure leading to an increased volume and quality of corporate reporting on natural capital topics. And as before, the UK government could convert this existing framework into a form of mandatory reporting (e.g. in company accounts). On the local level, both government and investors could opt to play a stronger role. 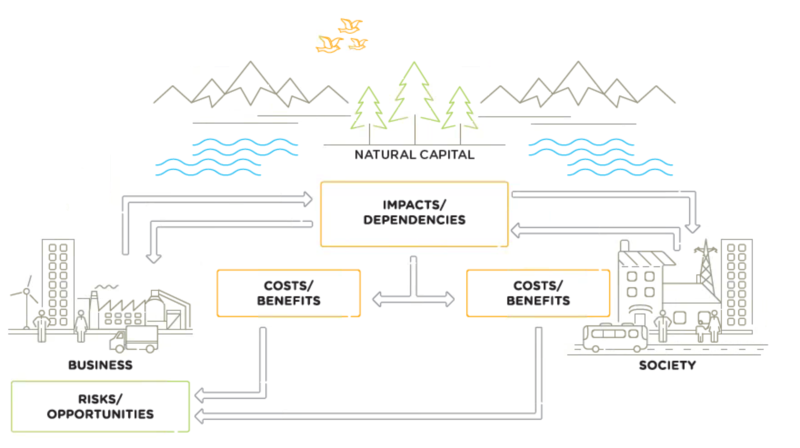 Whether through planning conditions, levies, or similar mechanisms, local governments can use natural capital policy as a method of environmental protection (and revenue-raising). Meanwhile, investors who provide project financing could incorporate natural capital assessments into their list of evaluation criteria. The assessment of natural capital dependencies offers a useful review of risks that could impact a project’s success. The new Protocol provides an important framework that standardises natural capital assessment. In the coming months, it will become clearer whether it is investors, governments, or corporates who are taking the most pro-active approach. Hopefully it will be a combination of all actors. In the long run, we all need the rain, and the natural world. 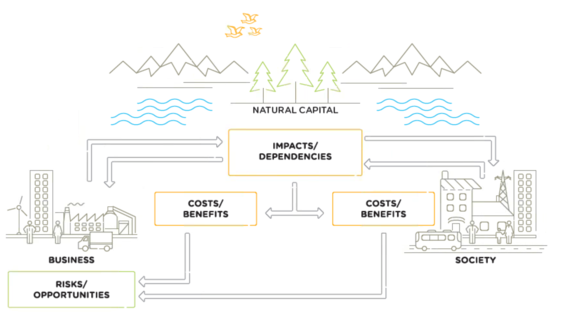 On 13th July 2016, The Natural Capital Coalition launched a standardized framework for business to identify, measure and value their impacts and dependencies on natural capital. This ‘ Natural Capital Protocol‘ has been developed through a unique collaborative process; a World Business Council for Sustainable Development consortium led on the technical development and an IUCN consortium led on business engagement and piloting. The Protocol is supported by practically focused ‘Sector Guides’ on Apparel and Food & Beverage produced by Trucost on behalf of Coalition.